This example shows how to visualize the changing pattern and coverage map of an antenna array as it scans a sweep of angles. The antenna array is created using Antenna Toolbox™ and Phased Array System Toolbox™. The array is designed to be directional and radiate in the xy-plane to generate a maximum coverage region in the geographic azimuth. Transmitter and receiver sites are created and shown on a map, and the pattern and coverage map are displayed as the antenna array is steered. Use Antenna Toolbox to design a reflector-backed dipole antenna element. Design the element and its exciter for 10 GHz, and specify tilt to direct radiation in the xy-plane, which corresponds to the geographic azimuth. Use Phased Array System Toolbox to create a 7-by-7 rectangular array from the antenna element. 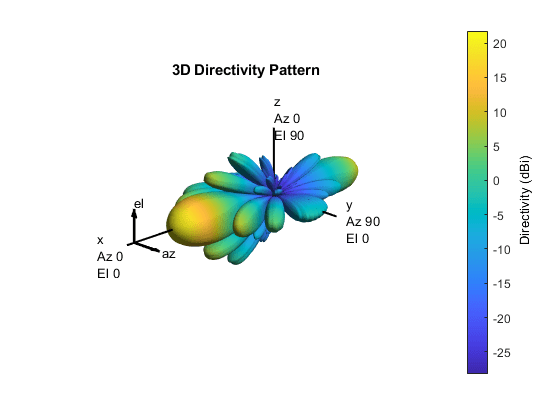 Specify the array normal to direct radiation in the x-axis direction. 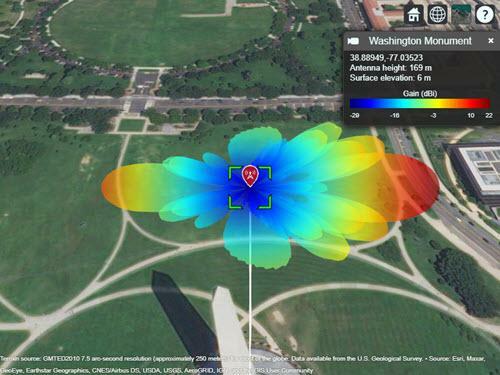 Create a transmitter site at the Washington Monument in Washington, DC using the antenna array. The transmitter frequency matches the antenna's design frequency, and the transmitter output power is 1 W. Set antenna height to 169 m, which is the height of the monument. Launch Site Viewer and show the transmitter site, which centers the view at the Washington Monument. The default map shows satellite imagery, and the site marker is shown at the site's antenna height. Visualize the orientation of the antenna by showing the radiation pattern in Site Viewer. Select the site marker to view the color legend of the pattern. 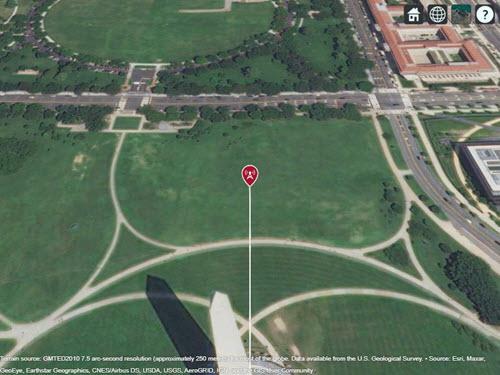 Create an array of receiver sites in the Washington, DC area. These are used as place markers for sites of interest to assess the coverage of the transmitter site. % Create array of receiver sites. Each receiver has a sensitivity of -75 dBm. Show receiver sites on a map. Set the map imagery using the Basemap property. Alternatively, open the map imagery picker in Site Viewer (Antenna Toolbox) by clicking the second button from the right. Select "Streets" to see streets and labels on the map. Scan the antenna beam by applying a taper for a range of angles. For each angle, update the radiation pattern in Site Viewer. This approach of scanning the beam produces different patterns than physically rotating the antenna, as could be achieved by setting AntennaAngle of the transmitter site. This step is used to validate the orientation of the antenna's main beam. % Update the radiation pattern. Use a larger size so the the pattern is visible among the antenna sites. Define three signal strength levels and corresponding colors to display on the coverage map. Each color is visible where the received power for a mobile receiver meets the corresponding signal strength. The received power includes the total power transmitted from the rectangular antenna array. The default orientation of the transmitter site points the antenna x-axis east, so that is the direction of maximum coverage. The coverage map shows no coverage at the transmitter site and a couple of pockets of coverage along the boresight direction before the main coverage area. The radiation pattern provides insight into the coverage map by showing how the antenna power projects onto the map locations around the transmitter. Scan the antenna beam by applying a taper for a range of angles. For each angle, update the coverage map. This method of beamscanning is the same method used above. The final map includes two receiver sites of interest within the coverage region.